Here's another post from Deedy, who is apparently gallivanting about reveling in historical stuff. We all wish she'd get back to us Izzy Elves! Today we spent a couple of hours visiting 1830 via the Monadnock History and Culture Center in Peterborough, New Hampshire. There we met re-enactors Lorraine Walker, John Patterson, and Brigham Boice, who portrayed Nancy, Samuel and Augustus Prescott. This was the family who, in the 1820s-30s, actually lived in the house that visited. The demonstration we watched was of hearth cooking, foraging and preserving food. Here is the garden planted and cared for by "Mr. Prescott". Much of the food prepared inside the house (on the right) comes from this garden. You can see that "Mrs. Prescott" is wearing a mobcap, just like Clara's stepmother does in A Buss from Lafayette. She is also wearing a kind of pinafore over her dress to keep it clean while working in the kitchen. Just as at Clara's house in my story, sugar comes in large, cone-shaped, rock hard loaves. One of such loaves can be seen (wrapped in blue paper) on the shelf over the fireplace. You might remember my writing somewhere that the color of the paper wrapping was used because it made the sugar itself look whiter! Here is the fireplace, with the beehive oven on the left side, being readied for baking loaves of bread. "Mr. and Mrs. Prescott" explained that no matter how careful the cook was in baking bread, there were always some ashes on the bottom. Apparently richer people could afford to buy the non-ashy top part of the bread, leaving the lower, ashy bottom bits for poorer people. This is the origin of the term "upper crust." 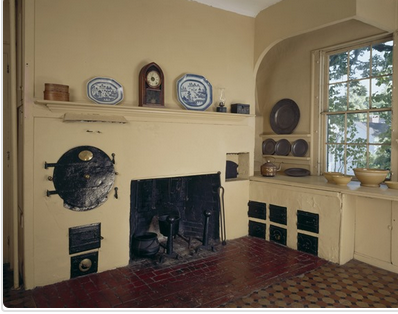 Of course, in A Buss from Lafayette, the Hargraves family has an "ultra modern" Rumford Range, such as the one shown below, and did very little cooking in the fireplace. The Rumford Range is on the right under the window. It is a brick structure with holes that have fitted pots, underneath which are levels for burning charcoal, and then cleaning out the ashes from the bottom level. The advantage was that cooks could stand up, not bend over, and smoke did not get in their eyes. When oh when will she start paying attention to us Izzy Elves??? Here's what she just wrote about Lafayette again. Sigh. Shiver in the cold in a place called Valley Forge?